در این مطالعه نانوفسیل­های آهکی برش نیمبلوک در شمال باختر قائن ارزیابی و بررسی شده ­است. برش نیمبلوک با ستبرای 164 متر شامل سنگ‌آهک، مارن و شیل است. 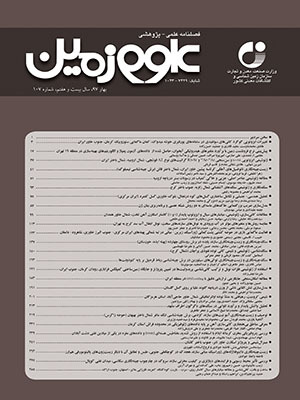 در برش مورد مطالعه 76 گونه نانوفسیلی متعلق به 30 جنس از 15 خانواده شناسایی شد. بر پایه نانوفسیل­های شناسایی شده، بخشی از زیرزون CC7b و زیست‌زون­ CC8 و بخشی از زیست‌زون CC9 از زیست‌زون‌بندی Sissingh (1977) و زیرزون NC7Cو زیست‌زون­های NC9, NC8 و بخشی از زیست زون NC10از زیست‌زون‌بندی Roth (1978)تشخیص داده شده­اند و سن نسبی آپتین پسین- آلبین و سنومانین پیشین؟ (late Aptian–Albian- early Cenomanian?) برای نهشته­های این برش پیشنهاد می‌شود. Calcareous nannofossils of Nimbolook section in north west of Qayen, east of Iran have been investigated. The section is 164 m thick and consists of limestone, marlstone and shale. Seventy six nannofossil species belong to thirty genera from fifteen families were identified. Based on the identified calcareous nannofossils, a part of subzone CC7b and biozone CC8 and a part of biozone CC9 of Sissingh biozonation (1977) and a part of subzone NC7 and biozones NC8, NC9 and a part of biozone NC10 of Roth biozonation (1978) have been suggested for the Nimbolook section. Therefore, an age of late Aptian–Albian and early Cenomanian? is assigned to the deposits of this section. اسدی، ا.، 1392- چینه‌نگاری زیستی و محیط دیرینه نهشته­های کرتاسه زیرین بر اساس اربیتولین­ها در برش نیمبلوک (شمال غرب قائن) شرق ایران، پایان‌نامه کارشناسی ارشد دانشگاه بیرجند، 118ص. اشتوکلین، ی.، افتخارنژاد، ج. و هوشمند زاده، ع.، 1352- بررسی مقدماتی زمین‌شناسی در لوت مرکزی، شرق ایران، سازمان زمین‎شناسی و اکتشافات معدنی کشور، گزارش شماره 22، 86 ص. رئیس‎السادات، س. ن.، اسدی، ش.، زارعی، ح.، خزاعی، ا. ح.، مرتضوی، م.، معتمدالشریعتی، م.، موسوی‎نیا، ع.، مولودی، د. و یزدی مقدم، م.، 1393- چینه‎نگاری، دیرینه‎بوم‎شناسی و دیرینه‌زیست‌جغرافیای رسوبات کرتاسه در شرق بلوک لوت (ناحیه قائن)، مجموعه مقالات هجدهمین همایش انجمن زمین‎شناسی ایران، دانشگاه تربیت مدرس، 3 تا 4 دی­ماه، صص. 600 تا 610. رئیس‎السادات، س. ن.، موسوی‎نیا، ع.، خزاعی، ا.، اسدی، ش.، 1390- چینه‎نگاری رسوبات کرتاسه در (جنوب قائن) شرق ایران، پنجمین همایش انجمن دیرینه‎شناسی ایران، صص. 216 تا 222. شریفی، ج.، 1394- چینه‎نگاری و پالئواکولوژی رسوبات کرتاسه در برش های نیمبلوک و کرچ (غرب قائن) بر مبنای فون آمونیتی، پایان نامه کارشناسی ارشد، 136 ص. مولودی، .د.، معتمدالشریعتی، م.، رئیس‎السادات، س. ن. و مرتضوی، م.، 1393- پالئواکولوژی نهشته‌های رسوبی کرتاسه (آلبین-سنومانین؟) در شمال غرب قائن بر اساس فرامینیفرا .هشتمین همایش دیرینه‌شناسی ایران، دانشگاه زنجان. هادوی، ف.، نطقی مقدم، م.، خدادادی، ل. و رضازاده، ف.، 1393- نانواستراتیگرافی نهشته‌های کرتاسه پیشین درفتح آباد (شمال غرب قائن)، مجموعه مقالات سی و سومین گردهمایی علوم زمین، سازمان زمین‎شناسی و اکتشافات معدنی کشور. Applegate, J. L. and Bergen, J. A., 1988- Cretaceous calcareous nannofossil biostratigraphy of sediments recovered from the Galicia Margin, ODP Leg 103. In: Boillot, G., Winterer, E. L., et al., Proc. ODP, Sci. Results, 103: College Station, TX (Ocean Drilling Program), p. 293–348. Bown, P. R. and Young, J. R., 1998- Techniques. In: Bown, P. R. (Ed. ), Calcareous Nannofossil Biostratigraphy. British Micropaleontological Society Publications Series, Chapman and Hall (Kluwer Academic Publishers), London, pp. 16–28. Bown, P. R., 1998- Calcareous Nannofossil Biostratigraphy, British Micropalaeontological Society Publication Series, Chapman and Hall (Kluwer Academic Publishers) pp. 1-315. Bralower, T. J., Monechi, S. and Thierstein, H. R., 1989- Calcareous nannofossil zonation of the Jurassic- Cretaceous boundary interval and correlation with the geomagnetic polarity timescale. Marine Micropaleontololgy 14, 153-235. Bramlette, M. N. and Riedel, W. R., 1954- Stratigraphic value of discoasters and some other microfossils related to Recent coccolithophores. Journal of Paleontology 28, 385-403. Bramlette, M. N. and Sullivan, F. R., 1961- Coccolithophorids and related Nannoplankton of the early Tertiary in California. Micropaleontology, 7 (2), 129-188. Bramlette, M. N. and Wilcoxon, J. A., 1967- Middle Tertiary calcareous nannoplankton of the Cipero section, Trinidad, W. I. Tulane Studies in Geology and Paleontology 5 (3), 93-131. Burnett, J. A., 1998- Upper Cretaceous. In P.R. Bown (Ed. ), Calcareous Nannofossil Biostratigraphy. British Micropaleontology Society Publications Series, Kluwer Academic Publishers, London, pp. 132-199. Clap, F. G., 1940- Geology of Eastern Iran. Bulletin of the Geological Society of America 51, 1-102. Do Monte Guerra, R., Riogi Tokutake, L. and Fauth, G., 2011- Cretaceous calcareous nannofossils from Pelotas Basin, Brazil: Biostratigraphic and paleoecological inferences. Journal of South American Earth Sciences, 36, 55-71. Erba, E., 2004- Calcareous nannofossils and Mesozoic oceanic anoxic events, Marine Micropaleontology 52, 85-106. Erba, E., Castradori, D., Guasti, G. and Ripepe, M., 1992- Calcareous nannofossils and Milankovitch cycles: the example of the Albian Gault Clay Formation (southern England). Palaeogeography, Palaeoclimatology, Palaeoecology 93, 47-69. Fauvelet, E. and Eftekharnezhad, J., 1990- (compiler). Explanatory text of the Qayen quadrangle geological map, 1/250000 scales, 200 pp. Geological Survey of Iran, Tehran. Herrle, J. O., Pross, J., Friedrich, O., Kößler, P. and Hemleben, C. 2003- Forcing mechanisms for mid-Cretaceous black shale formation: evidence from the Upper Aptian and Lower Albian of the Vocontian Basin (SE France), Palaeogeography, Palaeoclimatology, Palaeoecology 190, 399-426. Linnert, C. and Mutterlose, J., 2009- Evidence of increasing surface water oligotrophy during the Campanian–Maastrichtian boundary interval: Calcareous nannofossils from DSDP Hole 390A (Blake Nose). Marine Micropaleontology, 73, 26–36. Manivit, H., Perch-Nielsen, K., Prins, B. and Verbeek, J. W., 1977- Mid Cretaceous calcareous nannofossil biostratigraphy. Proceedings of the Koninklijke Nederlandse Akademievan Wetens chappen, B 80, 3, 169-81. Motamedalshariati, M., Raisossadat, S. N., Moloudi, D., and Mortazavi, M., 2016- Foraminifera biozonation and morphogroups from Nimbolook section, east margin of Lut block, Iran. Arabian Journal of Geoscience, 9, 720 (1-11), DOI 10.1007/s12517-016-2709-y. Mutterlose, J., 1992- Biostratigraphy and palaeobiogeography of Early Cretaceous nannofossils. Cretaceous Research 13, 167-189. Mutterlose, J., Bornemann, A. and Herrle, J. O., 2005- Mesozoic calcareous nannofossils state of the art. Palaontologische Zeitschrift 79/1, 113-133. Perch-Nielsen, K., 1985- Mesozoic calcareous nannofossils. In: Bolli, H. M., Saunders, J. B., Perch- Nielsen, (Eds. ), Plankton Stratigraphy, Cambridge Univ. Press, Cambridge, pp. 329-427. Raisossadat, S. N., Wang, P. L., Mortazavi, M., Motamedalshariati, M. and Sharifi, J., 2015- Biostratigraphy and chemostratigraphy of Upper Albian-Lower Cenomanian deposits in southwest Qayen area of eastern Iran, 2nd International Congresson Stratigraphy, STRATI 2015, Abstract, Berichtedes Institutes für Erdwissen schaften Karl-Franzens-Universität Graz, Band 21, p. 316. Roth, P. H. and Thierstein, H., 1972- Calcareous nannoplankton: Leg 14 of the Deep Sea Drilling Project. In: Hayes, D. E., Pimm, A. C., et al., Initial Reports DSDP, 14, 421-485. Roth, P. H., 1978- Cretaceous nannoplankton biostratigraphy and oceanography of the Northwestern Atlantic Ocean. Initial Report Deep Sea Drilling Project, 44, 731-59. Sissingh, W., 1977- Biostratigraphy of Cretaceous calcareous nannoplankton. Geol. Mijnbouw 56 (1), 37-65. Thierstein, H. R., 1971- Tentative Lower Cretaceous nannoplankton zonation. Eclog. Geol. Helv. 64, 459-88. Tiraboschi, D., Erba, E. and Jenkyns, H. C., 2009- Origin of rhythmic Albian black shales (Piobbico core, central Italy): Calcareous nannofossil quantitative and statistical analyses and paleoceanographic reconstructions. Paleoceanography, 1-21. Winter, A., Jordan, R. W. and Roth, P. H., 1994- Biostratigraphy of living coccolithophorids in Ocean waters, in Winter, A., Siesser, W.G., (Eds), Coccolithophores: Cambridge University Press, pp. 161-178.